It is often mentioned that the iPad is encroaching on the territory of the traditional analog book. Now, it is ready to take a stab at the analog coloring book. 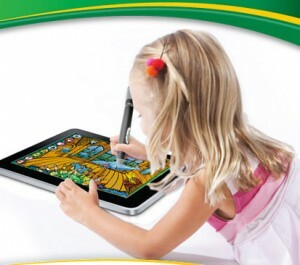 With Griffin Technology”s Crayola ColorStudio HD, you can turn your iPad into a children”s coloring book. It includes all the fun of coloring without having to worry about cleaning up afterwards or losing a crayon (or someone swallowing one). It even includes “boundary recognition” software which prevents children from coloring outside the lines. And, in a nice touch, the custom stylus is shaped like a crayon. ColorStudio HD is scheduled for release in May of this year and will retail at $29.99. You can check out a video of the software in action here.